With sea ice at its lowest point in 1,500 years, how might ecological communities in the Arctic be affected by its continued and even accelerated melting over the next decades? In a review article in the journal Science, to be published on 2 August 2013, Eric Post, a Penn State University professor of biology, and an international team of scientists tackle this question by examining relationships among algae, plankton, whales, and terrestrial animals such as caribou, arctic foxes, and walrus; as well as the effects of human exploration of previously inaccessible parts of the region. "Our team set out to explore the 'domino effect' of sea-ice loss on marine animals, as well as on land-dwelling species living adjacent to ice," Post said. "Arctic sea ice should be thought of as a biome or an ecosystem and the effects of melting and warming on microorganisms living under ice in this biome already have received much attention. However, those animals living near the ice likely are feeling the effects, as well." Post explained that, after reaching its record low in August of 2012, sea ice is expected to continue to melt at an accelerating rate. "Over the entire period covered by the record, Arctic sea ice has declined by more than 86,000 square kilometers—a space slightly larger than the state of South Carolina—per year," Post said. "That's an area of critical habitat for many species and the rate of loss is increasing." Post added that an acceleration of this rate likely will be due, in part, to the loss of albedo—the white surface provided by ice that reflects sunlight—thereby causing a cooling effect. The high albedo of ice, Post added, will be replaced by a much less-reflective, darker surface of open water—and the effect will be accelerated warming and thus, accelerated melting. "By viewing sea ice as essential habitat and a substrate for important species interactions, rather than as a lifeless blank surface, its loss as a result of warming becomes a rather stunning prospect," Post emphasized. The domino effect of sea-ice melting on terrestrial animals, Post explained, could happen in the following way though a disruption in the food chain: Sea-ice algae and sub-ice plankton, which together account for 57 percent of the total annual biological production in the Arctic Ocean, already are being immediately affected by sea-ice melting because ice loss triggers a significant change in the blooming times of these organisms. Likewise, land adjacent to areas of sea-ice loss will experience significant surface warming inland from the coastline, affecting soil conditions and plant growth. 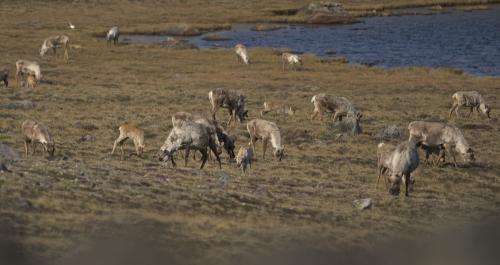 In their review article, Post and his colleagues hypothesize that, while invertebrate ocean-dwelling animals such as zooplankton that feed on algae and phytoplankton in the seas already are being affected, larger terrestrial animals such as caribou could find their land-dwelling food sources disrupted, as well, due to temperature changes affecting plant communities inland. "A change in population mixing could be another, indirect effect of sea-ice melting," Post said. 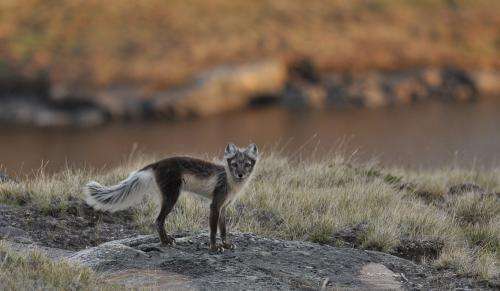 He explained that populations of wolves and arctic foxes that currently are isolated only during the summer could become even more isolated: A longer period of the year without ice, which promotes travel between populations, could lead to a decline in crossbreeding. However, for other species, the effect of sea-ice loss could be just the opposite: "We know that, for some species, sea ice acts as a barrier to intermixing," Post explained. "So ice loss and a lengthening of the ice-free season likely will increase population mixing, reducing genetic differentiation." Post explained that, for example, polar and grizzly bears already have been observed to have hybridized because polar bears now are spending more time on land where they have contact with grizzlies. While such mixing of populations is not necessarily cause for concern, Post explained, it could lead to drastic changes in disease dynamics. For example, a population that currently is a host to a certain pathogen could carry that pathogen to another, previously unexposed population. 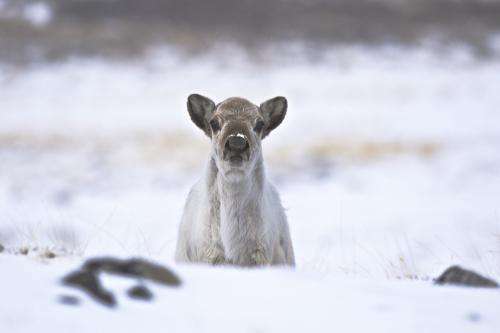 "In addition, a decrease in sea ice in arctic Canada likely will increase contact between eastern and western arctic species, promoting mixing of pathogen communities that previously were isolated," Post said. "For example, phocine distemper virus (PDV) currently affects eastern Arctic seals. But if these seals begin to mix with western arctic seals, the virus may reach other, naive populations." Furthermore, mere crowding of animals in coastal habitat as sea ice retreats also could present challenges to the health and vitality of populations of some species, especially walrus, Post explained. "Walrus are benthic feeders," Post said, "which means they are specialists in foraging for food that occurs only in shallow waters. They also use the edge of the sea ice to rest and dive from while foraging. However, as sea ice melts and its edge retreats from the shoreline, it becomes located above deeper water. As a result, walrus have been observed abandoning the retreating ice edge and congregating along shorelines, from which they can try to maintain access to shallow water. This behavior, however, increases the local density of animals on such 'haulouts,' and can promote transmission of pathogens as well as lead to trampling of young." Post added that greater accessibility of previously remote parts of the Arctic to human exploration could be yet another unexpected consequence of sea-ice loss. "Retreating sea ice, longer ice-free seasons, and loss of sea ice are expected to promote development of shipping lanes and increased shipping traffic in areas that formerly were rather inaccessible," Post said. "This increased marine access likely will accelerate the pace of mineral and petroleum exploration in the Arctic, which in turn could affect both terrestrial and marine animals; for example, bowhead whales and Pacific walrus." More information: "Ecological Consequences of Sea-Ice Decline," by	E. Post et al Science, 2013.